John Meadowes, who had been ignominiously fired from his job, let his already bullied, over-worked, and nerve-ridden mind plot revenge on the man who ruined his life. Now, can Dixon Hawke find the evidence that puts Meadowes at the scene of the murder? Or will Meadowes escape to join the army and die gloriously in the coming war? The band at the head of the column of troops which was holding up the Farringdon Street crowds, was playing "The Entry of the Gladiators," and John Meadowes, who had just been ignominiously fired from his job, said: "Oh, cuss 'em all." He bought a special edition of the evening paper from a newsvendor who hurried by, glanced at the heavy headlines announcing the imminence of war, and said: "They use me for a doormat all my life, kick me about just to suit their mood, and now they're saying: 'Give the poor sucker three cheers and he'll go and die for us.' Yes — perhaps he will, but not in quite the way they think." Meadowes' pale face puckered into a fierce frown, and he glanced up at the vast, dingy face of the office block behind him. The stirring military march, the grim faces, the fatalistic outlook of the moment all combined to crystallise in the mind of the diffident clerk a terrible resolve. In normal times it wouldn't have been possible. The bullied, overworked, nerve-ridden clerk would have heaved one more sigh at his own inadequacy, and gone his weary way. But his over-imaginative mind had so far anticipated events that he already regarded himself as having killed some hundreds of the enemy. If he had not actually done this, he felt that it was only a matter of days before he would be doing so, and he had thus brought himself to the frame of mind of the hot-blooded killer. Like the nation in its entirety at that moment, he was in the mood for suiting actions to thoughts, and, thrusting his paper in his jacket pocket, he hurried into the block of offices and darted swiftly up six sets of curving stairs. No one saw him. He just managed to reach the first landing as the caretaker came out of his basement and closed the double front door of the offices, and the remainder of the stairs were deserted. On the sixth floor he thrust open the outer office door labelled "M. Anderson Blount, Fur and Glove Importer." This led him through the little office which he himself had occupied until a few minutes before, through the typists' room, and into Blount's private office, which overlooked the street. Standing looking through the wide-open window, his back to the large desk, by the side of which was a dictaphone, was the portly figure of Blount. Blount had been making a habit of speaking his thoughts into this machine every evening, and the typists made what they could of these, filing their transcripts away against the time when they should be required for moulding into the form of "A Business Man's Private Diary," which was the title of the book he intended publishing. It did not need the sight of Blount's placid figure to incense Meadowes to murder pitch. He was still fired by the impulse that had sent him scurrying in from the pavement below. "Stirring, isn't it, Blount?" he said suddenly. He had never called Blount anything but "sir " before. Blount turned and started at the sight of Meadowes' inflamed countenance and the fanatical glint in his eyes. "They're off to fight to make you a bit fatter." "What the devil do you want?" exclaimed Blount, in surprise. "But it will be in vain. You aren't going to get fat — see!" Meadowes threw himself at his late employer with complete abandon. Blount gasped as Meadowes' shoulder rammed against his stomach, and he sat heavily on the windowsill, grabbing frantically at Meadowes' clothes. Meadowes' fist thudded into his face, and Blount's head struck hard against the under edge of the raised window-frame, stunning him. Blount toppled over and hurtled to the pavement far below. The shouts of the people down there drowned the sounds of the band for a moment. Meadowes stepped back into the somewhat darkened room, with the certain knowledge that no one had seen the attack. He glanced at the dictaphone, and found that it was switched off, and that there was no record in it. Then, after a swift inspection of the office to assure himself that he was leaving no trace of his visit, he went to the outer door. He would join the army that night, and his mind would thenceforth be sufficiently occupied to banish all memory of what had happened. There were voices in the passage below, and people were coming up the stairs. His escape was cut short, but he was not at a loss. Hanging his hat on the peg in his own office, he sat at his desk, turning papers out of the drawer. The disquieting thought that Blount might have lived to tell of the attack proved a false alarm. The police constable who came in told him that Blount was dead, and asked if he had seen him fall. "No, I didn't see him fall. Goodness! What's happened?" gasped Meadowes, giving a realistic display of alarm. Dixon Hawke heard the inquest because he happened to be sitting in the East Central Coroner's Court when it came on. He was interested in another case, but he became even more interested in this one. 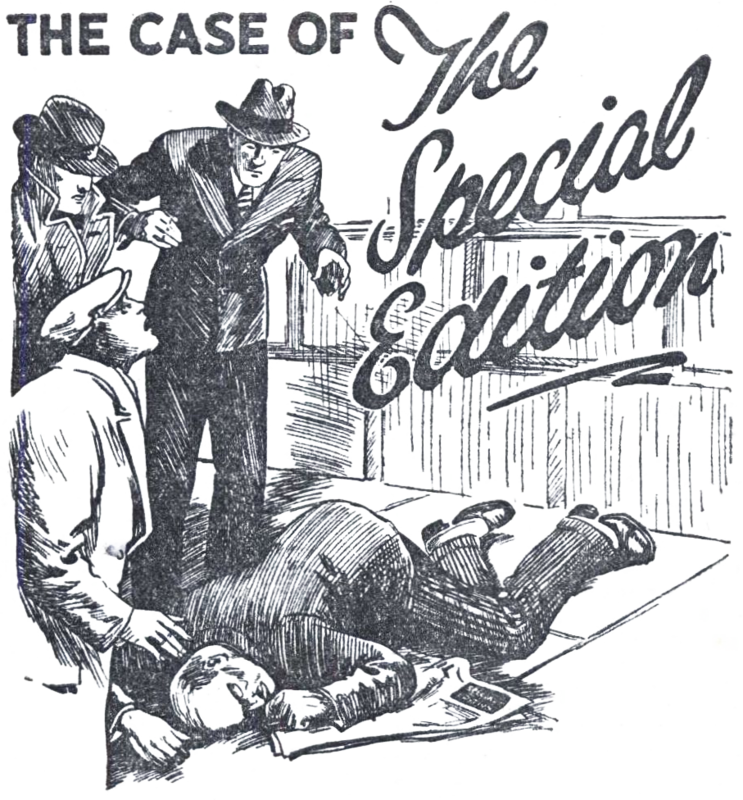 His friend, Detective-Inspector Gray, deposed to the effect that the deceased had had a copy of the latest issue of the Evening Comet in his hand. It was a special edition issued on account of the crisis, and the witness's own conclusion was that he had either fallen out in his excitement or had committed suicide in despair. The tragic incident had occurred at ten minutes past eight. John Meadowes stated that he had returned to his office at eight, and had sat at his desk collecting his private papers, that being his last day of employment there. He had been there for about ten minutes when the police came up and informed him of what had happened. The caretaker of the block of offices then gave evidence. He stated that he was not aware that Mr. Meadowes had returned. He (the caretaker) had been watching the band; he had left the doorway for only a minute to go into the basement, and Mr. Meadowes must have come in during that time. He knew that Mr. Blount was still in the building, for he was waiting for the lift-bell to ring. Mr. Blount always used the lift. Tommy Burke, Hawke's young assistant, who was sitting in the court by his employer's side, suddenly became aware that Hawke was staring at him, frowningly. "You remember we were jammed in New Bridge Street in the car last night?" he murmured. "Yes. On account of those troops." "That was at seven minutes past eight, and the newsboys were rushing out of the Comet office with the first batches of that special edition." "That's right. It must have taken the fellow another minute to get up Farringdon Street." Tommy saw his point, and nodded. "I don't suppose Blount slid down the bannisters to get his paper, sir!" "He'd have needed to slide up them again to jump out of the window by ten past." Hawke put this point to Gray after the sitting, and that officer called the caretaker aside. "Mr. Blount didn't come down to get any paper," asserted the man. "He'd have used the house telephone, and I'd have taken him one up in the lift — in a tenth of the time in which he could have come down the stairs and got back again. Besides, I tell you he never used the stairs. Mr. Meadowes must have taken the paper up." "I believe," said Hawke, after the inspector had dismissed the caretaker, "Meadowes said he did not go into Blount's private office, and did not know Blount was there." "Then how did Blount come to get hold of his paper?" "I don't know that it makes an altogether overwhelming case against Meadowes, but there's certainly something that needs explaining away. Where is Meadowes?" On inquiry, they learned that Meadowes had gone. Hawke and Tommy presently accompanied the Scotland Yard man to the Farringdon Street offices. Business had been suspended for the day, but there was a clerk in charge. They made a careful inspection of the place, and Hawke examined the dictaphone machine. Several cylinders had been set on one side, but the last one to be used was identifiable by reason of the fact that it had recorded the music of the military band. The sounds of "The Entry of the Gladiators " were very faint at first, but became louder, as though a window had suddenly been opened. Then a man's voice was heard — louder than the music. The clerk identified it as Blount's voice. He appeared to have been affected by the martial spirit of the moment, for there was emotion both in the diction and in the substance of his words. He continued speaking for a few moments, and the sounds of the music died down. Then, abruptly, the record went dead, the machine having been switched off at that point. "It doesn't give us any clue to what happened," remarked Gray. "No," agreed Hawke, "but it gives a fairly strong hint of what didn't happen. It fixes the time, and it proves that he didn't leave this room to buy a paper. And it could only have been a second or so after he switched off that he went out of the window. Yet his remarks are not a bit like those of a man contemplating suicide, are they? I think we'll pay a visit to Meadowes." Meadowes lived in a small, self-contained flat at Aldgate, but he was out when the three arrived. The hall-porter eyed them with interest when they inquired about Meadowes. "He went out about half an hour ago," said the man. "Said he was going to join the army." "Did he give you any idea where he intended enlisting?" inquired Gray. "Not in words 'e didn't, but in deeds 'e did. I fancy I saw 'im go into the Green Man down the road, an' if you ask me, about all the enlistin' 'e'll do will be to enlist the sympathy of the landlord." The landlord of the Green Man knew Meadowes, and he was even more interested at the mention of his name than the hall-porter at the flats had been. "Yes, gentlemen," he said. "Mr. Meadowes has been here, but he's been gone some little time." The landlord was able to give the name of another tavern that Meadowes was known to visit, and the barman there had similar news about him. "There's going to be no war," said the barman. "That bloke's got a strangle 'old on the situation!" "Did he say he was going to join the army?" "No. He said he was going to invite the army to join up with him. He had a couple of drinks, and I was glad to see him go. He was in a mind for starting something. You might find him at the Duck and Drake." Meadowes had blazed a trail at the Duck and Drake. One of the attendants was clearing up broken glass, and another was supplying a customer with a piece of sticking plaster. "Not a blinkin' policeman in sight — as usual," said the landlord. "I s'pose they've all gone on 'oliday. We couldn't 'old 'im. He was like a waggonload of wildcats." Other inquiries proved abortive, and the party returned to the flat. "Yes," said the porter. "He's in. His flat's number seventeen, top floor." The visitors mounted the stairs and found the door of number seventeen slightly ajar. Entering the sitting room, they found the table strewn with short, snub-nosed bullets. Meadowes had just snapped home the breach-cover of a rather rusty Colt .45 revolver, which he pointed menacingly at the callers. It was apparent, at first sight, that he had worked himself up to a dangerous emotional pitch, and that this condition had been further aggravated by the liquor he had taken. "What do you want?" he snapped. "Don't come near me," he added. "This'll finish you. It's dangerous. It finished a lot of Germans in the last war." Some indication of his mental condition was given when he suddenly became conversational and appeared to forget his threats. "An uncle of mine brought it back," he said. "He was in the Canadian Expeditionary Force, at Bapaume." "Yes, yes," said Gray, soothingly. "Never mind that now. We just want to have a little talk with you." Gray had taken half a pace forward, and, without the slightest warning, Meadowes had fired. The officer gasped with pain, and clapped his left hand to his right elbow. Hawke saw the metal ring — the end view of the gun barrel, and he ducked and overturned the table. He looked up to find Meadowes still standing against the wall, his wild eyes fixed unwinkingly on him, and still holding the weapon steadily, pointing it at his chest. "Now tell me," said Meadowes, "what it is you've come about." Hawke did some lightning thinking. "I was just with my friend," he said. "He's making inquiries about a street accident." "Liar!" shouted Meadowes. "I know who you are. You're Hawke. I saw you at the inquest. You think I pushed Blount out of the window. Go on! Say what you've got to say, and don't stall. I shall know if you're making anything up." Hawke knew that there was nothing to be gained by further bluffing, so he told the exact nature of his mission in a firm, clear tone. "The whole thing boils down to this," he concluded. "How did Blount get his evening paper? I have since inquired at the Comet office, and have been assured that the very first copies of that edition did not come off the machine until six minutes past eight." "You're as clever as the devil," said Meadowes, whose face was white and whose eyes were glittering. "You 're too darned clever for this world." Hawke had the horror of seeing the hammer move back as Meadowes' finger pressed steadily on the trigger. Meadowes went on speaking. "If you want to know, he pulled it out of my pocket as he fell — "
The explosion was much louder than the previous one, and Hawke thought this must be due to the effect of his being shot. To his surprise he found himself free of pain, and with no trace of any injury. Then he realised that several pictures had shattered and fallen to the floor, and that the room was filled with acrid smoke. Meadowes was lying on the floor, bleeding and unconscious. All three visitors had had remarkable escapes, the walls all about them having been struck by the flying fragments of the burst revolver. It had lain unused too long, and the inside of the barrel had become dangerously rusted. Doubtless the first shot had had the effect of weakening or cracking the metal. Meadowes' injuries were fatal, but in the hospital he recovered consciousness and he appeared perfectly normal once more, when Hawke and Gray again interviewed him. "You said old Blount had talked about me into the dictaphone, just before I bumped him off," he said, looking up at Hawke. "What did he say?" "He said," answered Hawke, after an exchange of glances with Gray, "that the band inspired him to think on broader and more generous lines about the duty of Englishmen to one another. He felt that he hadn't treated you fairly, and dictated instructions to his secretary to reinstate you at an increased salary."